Grab your scuba gear and your open-water swim goggles — we're diving into The Trench. The Hollywood Reporter detailed on Friday, February 8 that Warner Bros. Pictures is working on an Aquaman spin-off entitled (you're ahead of us here, readers) The Trench. The studio didn't comment on the news, nor did it release any additional information on the project — but, as THR always does, the outlet provided as much information about the spin-off as possible. First up is the knowledge that The Trench already has two writers attached: fresh-faced scribes Noah Gardner and Aiden Fitzgerald, who previously worked as assistants at Star Wars: Episode IX director J.J. Abrams' Bad Robot production banner while the filmmaker was crafting his 2011 sci-fi fantasy feature Super 8. Gardner and Fitzgerald will whip up what's being described as a "horror-tinged script" for The Trench, and will likely bring to the spin-off some of the same tense and foreboding atmosphere they were exposed to at Bad Robot during Abrams' Super 8 era. The pair will also pepper in some spooks and chills to the underwater feature — and do an apt job at it, as they both have joint experience creating unsettling projects after writing the "submarine thriller" called The Volos. Next is the confirmation that The Trench will take place in the Trench kingdom featured in Aquaman, the corner of the Seven Seas that served as a place of sacrifice. Those thrown into the Trench fall victim to its briny waters and lack of light (a result of the kingdom being exiled from the rest of the survivors after Atlantis fell and sunk to the ocean) and gradually transform into vicious monsters reminiscent in physicality of anglerfish and in attitude of a hot-headed villain. 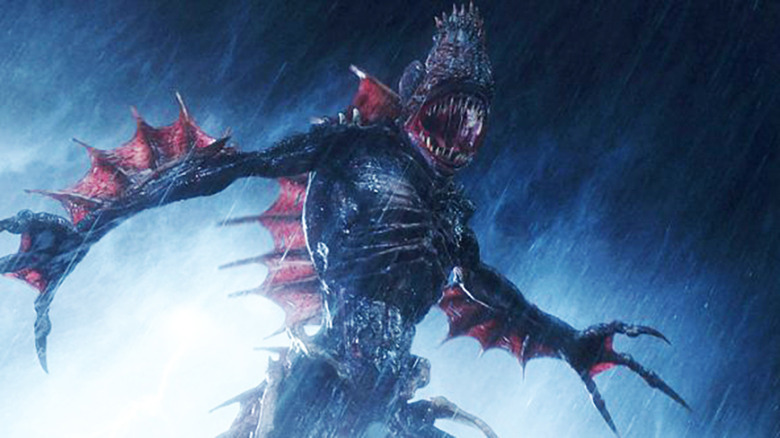 Those who caught Aquaman in theaters know that the Trench people weren't a huge part of the storyline — they attacked Arthur Curry (Jason Momoa) and Mera (Amber Heard), who were able to fight them off before getting sucked into a wormhole that sent them to a hidden part of the sea at the Earth's center. The place itself was important to the plot, as Arthur's mother, Queen Atlanna (Nicole Kidman), was sacrificed to the Trench after the Atlanteans discovered that she married and had a son with a human. She wound up escaping and found safety in the uncharted sea, where Arthur and Mera rescued her. As THR notes, the Trench monsters are fairly recent additions to the trove of Aquaman comic characters. It was only eight years ago, in 2011, when the monsters made their debut after DC Comics overhauled its publishing line. This, coupled with the fact that Aquaman didn't develop the people of the Trench as much as they did the other members of the Seven Seas (like the tribe of Xebel, the Fishermen kingdom, and the Kingdom of the Brine), allows for Gardner and Fitzgerald more freedom to play with the script for The Trench. With only a few years of Trench lore available, the screenwriting duo can make some creative choices of their own that will shape how the kingdom and its creatures are portrayed in the comics and on the big screen moving forward. Other details we know about The Trench: Aquaman director and Aquaman producer James Wan and Peter Safran will both serve as producers of the film, Warner Bros. is expected to keep its budget "more modest" than those of typical tentpoles coming from DC Films, and the main cast of Aquaman (like Momoa, Heard, Kidman, Willem Dafoe, Patrick Wilson, Yahya Abdul-Mateen II, and Dolph Lundgren) won't appear. An Aquaman spin-off — and a horror-centric one, at that — will bring that much more money into the DC Extended Universe and tack onto the $1.12 billion the original film has made worldwide since opening in December of 2018. Currently, Aquaman is the top-earning DCEU entry of all time based on global revenue, so Warner Bros. is wise to keep the Aquaman boat afloat, even if it hasn't given the official green-light to an Aquaman sequel just yet.